1 But see Unofficial mottos of Poland. 2 Although not official languages, Lithuanian and German are used in eight communal offices. 3 Administration area of Poland (area of administartion divisions) - land area (311 904 km²) and part of territorial sea; area of territory of Poland (according to Polish Law) - 322 577 km². 4 The adoption of Christianity in Poland is seen by many Poles, regardless of their religious affiliation, as one of the most significant national historical events; the new religion was used to unify the tribes in the region. 5 Also .eu, as Poland is a member of the European Union. Poland ( Polish: Polska), officially the Republic of Poland ( Polish: Rzeczpospolita Polska), is a country in Central Europe. It is bordered by Germany to the west, the Czech Republic and Slovakia to the south, Ukraine and Belarus to the east, and the Baltic Sea, Lithuania, and Russia (in the form of the Kaliningrad Oblast exclave) to the north. It also shares a maritime border with Denmark and Sweden. The total land area of Poland is about 312,685 sq km (120,728 sq mi) making it the 69th largest country in the world with population over 38.5 million people concentrated mainly in large cities, including the first capital of Poland, Cracow ( Polish: Kraków), and present capital, Warsaw ( Polish: Warszawa). The first Polish state was born in 966. Poland became a kingdom in 1025, and in 1569 it cemented a long association with the Grand Duchy of Lithuania by uniting to form the Polish-Lithuanian Commonwealth. The Commonwealth collapsed in 1795, and the Poles were without a state for 123 years. Poland regained its independence in 1918 after World War I but lost it again in World War II, emerging several years later as a communist country within the Eastern Bloc under control of the former Soviet Union. In 1989 it threw off the communist yoke and became what is informally known as the "Third Polish Republic". Today, as the 6th most populated member state of the European Union, Poland is a liberal democracy made up of sixteen voivodeships ( Polish: województwo). Poland is also a member of NATO, the United Nations, and the World Trade Organization. Poland began to form into a recognizable unitary and territorial entity around the middle of the 10th century under the Piast dynasty. Poland's first historically documented ruler, Mieszko I, was baptized in 966, adopting Catholic Christianity as the nation's new official religion, to which the bulk of the population converted in the course of the next century. In the 12th century Poland fragmented into several smaller states, which were later ravaged by the Mongol armies of the Golden Horde in 1241, 1259 and 1287. In 1320 Władysław I became the King of a reunified Poland. His son, Casimir III, repaired the Polish economy, constructed new castles, and won the war against the Ruthenian duchy ( Lviv (Lwów) became a Polish City). Poland was also a centre of migration of peoples and the Jewish community began to settle and flourish in Poland during this era. See History of the Jews in Poland. The Black Death which affected most parts of Europe from 1347 to 1351 did not reach Poland. 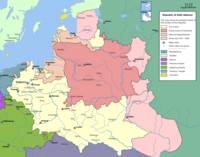 Under the Jagiellon dynasty, Poland forged an alliance with its neighbour Lithuania. A golden age ensued during the 16th century after the Lublin Union, which gave birth to the Polish-Lithuanian Commonwealth. The citizens of Poland took pride in their ancient freedoms and Sejm parliamentary system, with the szlachta nobility enjoying most benefits. Since that time Poles have regarded freedom as their most important value; Poles often call themselves the nation of the free people. In the mid-17th century a Swedish invasion rolled through the country during the turbulent time known as "The Deluge" (potop). Numerous wars against the Ottoman Empire, Russia, Cossacks, Transylvania and Brandenburg-Prussia ultimately reached an end in 1699. During the following 80 years, the waning of the central government and deadlock of the institutions weakened the nation, leading to anarchistic tendencies and a growing dependency on Russia. This eventually led to the ' Liberum Veto', which allowed for any member of parliament to break off the Sejm's proceedings during the session, effectively paralysing any attempt at reform. Russian Czars took advantage of this unique political vulnerability by offering money to Parliamentary traitors, who in turn would consistently and subversively block necessary reforms and new solutions. The Enlightenment in Poland fostered a growing national movement to repair the state, resulting in the first modern written constitution in Europe, the Constitution of May 3 in 1791. The process of reform ceased with the three partitions of Poland between Russia, Prussia, and Austria in 1772, 1793, and 1795, which ultimately dissolved the state. Poles resented their shrinking freedoms and several times rebelled against the partitioners (see List of Polish Uprisings). Napoleon recreated a Polish state, the Duchy of Warsaw, but after the Napoleonic wars, Poland was again divided by the victorious Allies at the Congress of Vienna. The eastern portion was ruled by the Russian Czar as a Congress Kingdom, and possessed a liberal constitution. However, the Czars soon reduced Polish freedoms and Russia eventually de facto annexed the country. Later in the 19th century, Austrian-ruled Galicia became the oasis of Polish freedom. During World War I all the Allies agreed on the restitution of Poland that United States President Woodrow Wilson proclaimed in Point 13 of his Fourteen Points. Shortly after the surrender of Germany in November 1918, Poland regained its independence as the Second Polish Republic (II Rzeczpospolita Polska). It reaffirmed its independence after a series of military conflicts, the most notable being the 1919-1921 Polish-Soviet War. The 1926 May Coup of Józef Piłsudski turned the reins of the Second Polish Republic over to the Sanacja movement. It lasted until the start of World War II on September 1, 1939, when Nazi Germany and the Soviet Union invaded Poland (September 17). Warsaw capitulated on September 28, 1939 and Poland was split into two zones, one occupied by Nazi Germany the other by the Soviet Union as agreed on in the Ribbentrop-Molotov pact. The eastern portion of the German-occupied zone was forged into the General Government area, and the western portion (most of which had belonged to Germany prior to World War I) was incorporated into the German Reich. Of all the countries involved in the war, Poland lost the highest percentage of its citizens: over 6 million perished, half of them Polish Jews. Poland also made the 4th largest Allied troop contribution, after the Americans, the British and the Soviets, to ultimately defeat Nazi Germany. At the war's conclusion, Poland's borders were shifted westwards, pushing the eastern border to the Curzon line. Meanwhile, the western border was moved to the Oder-Neisse line. The new Poland emerged 20% smaller by 77,500 square kilometres (29,900 sq mi). The shift forced the migration of millions of people – Poles, Germans, Ukrainians, and Jews. As a result of these events, Poland became, for the first time in its multicultural history, an ethnically unified country. A Polish minority is still present in neighbouring countries of Ukraine, Belarus, and Lithuania, as well as in other countries (see Poles article for the population numbers). The largest number of ethnic Poles outside of the country can be found in the United States. The Soviet Union instituted a new Communist government in Poland, analogous to much of the rest of the Eastern Bloc. Military alignment within the Warsaw Pact throughout the Cold War was also part of this change. In 1948 a turn towards Stalinism brought in the beginning of the next period of totalitarian rule. The People's Republic of Poland ( Polska Rzeczpospolita Ludowa) was officially proclaimed in 1952. In 1956 the régime became more liberal, freeing many people from prison and expanding some personal freedoms. Persecution of communist opposition figures persisted. Labour turmoil in 1980 led to the formation of the independent trade union, " Solidarity" ("Solidarność" in Polish), which over time became a political force. It eroded the dominance of the Communist Party; by 1989 it had triumphed in parliamentary elections, and Lech Wałęsa, a Solidarity candidate, eventually won the presidency in 1990. The Solidarity movement greatly contributed to the soon-following collapse of Communism all over Eastern Europe. A shock therapy program during the early 1990s enabled the country to transform its economy into one of the most robust in Central Europe. Despite a temporary slump in social and economic standards, there were numerous improvements in other human rights, such as free speech, a functioning democracy and the like. Poland was the first post-communist country to reach its pre-1989 GDP levels. In 1991 Poland became a member of the Visegrad Group and joined the North Atlantic Treaty Organization (NATO) alliance in 1999 along with the Czech Republic and Hungary. Poles then voted to join the European Union in a referendum in June 2003, with Poland becoming a full member on May 1, 2004. Poland is a liberal democracy. Its current constitution dates from 1997. The government structure centres on the Council of Ministers, led by a prime minister. The current prime minister of Poland is Jarosław Kaczyński. The president appoints the cabinet according to the proposals of the prime minister, typically from the majority coalition in the bicameral judicial lower house (the Sejm). The president, elected by popular vote every five years, serves as the head of state. The current president is Lech Kaczyński, the twin brother of Jarosław Kaczyński. Polish voters elect a bicameral parliament consisting of a 460 member lower house Sejm and a 100 member Senate ( Senat). The Sejm is elected under a proportional representation electoral system using the d'Hondt method similar to that used in many parliamentary political systems. The Senate, on the other hand, is elected under a rare plurality bloc voting method where several candidates with the highest support are elected from each constituency. With the exception of ethnic minority parties, only candidates of political parties receiving at least 5% of the total national vote can enter the Sejm. When sitting in joint session, members of the Sejm and Senate form the National Assembly, ( Polish Zgromadzenie Narodowe). The National Assembly is formed on three occasions: Taking the oath of office by a new president, bringing an indictment against the President of the Republic to the Tribunal of State, and declaration of a President's permanent incapacity to exercise their duties because of the state of their health. Only the first kind has occurred to date. The judicial branch plays an important role in decision-making. Its major institutions include the Supreme Court of Poland (Sąd Najwyższy), the Supreme Administrative Court of Poland (Naczelny Sąd Administracyjny) with judges appointed by the president of the Republic on the recommendation of the National Council of the Judiciary for an indefinite period, the Constitutional Tribunal of Poland (Trybunał Konstytucyjny) with judges chosen by the Sejm for nine-year terms, and the State Tribunal of Poland (Trybunał Stanu) with judges chosen by the Sejm for the current term of office of the Sejm, (except for the position of chairperson which is held by the First President of the Supreme Court). The Sejm (on approval of the Polish Senate) appoints the Ombudsman or the Commissioner for Civil Rights Protection ( Rzecznik Praw Obywatelskich) for a five-year term. The Ombudsman has the duty of guarding the observance and implementation of the rights and liberties of people and the citizens, the law and principles of community life and social justice. Kraków, Wawel castle by night. 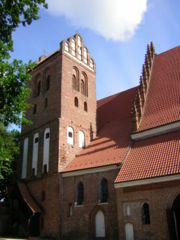 The Trinitarian Tower and the Cathedral in Lublin. Katowice, Silesian Insurgents Monument on the right and The Spodek in the background. The Polish landscape consists almost entirely of the North European Plain, with an average height of 173 m. The Sudetes (including the Karkonosze) and the Carpathian Mountains (including the Tatra mountains) form the southern border. This is also where one finds Poland's highest point, Rysy, at 2,499 m. Several large rivers cross the plains, i.e., the Vistula (Wisła), Oder (Odra), Warta and the (Western) Bug. Poland also contains over 9,300 lakes, predominantly in the northern part of the country. Masuria (Mazury Lake District) forms the largest and most-visited lake district in Poland. Remnants of the ancient forests are present: see list of forests in Poland, i.e. Białowieża Forest. Poland enjoys a temperate climate, with cold, cloudy, moderately severe winters and mild summers with frequent showers and thunderstorms. See also: a complete Gazetteer of Polish towns and settlements. Mikołajki in the Masuria lake area. Since its return to democracy, Poland has steadfastly pursued a policy of liberalising the economy and today stands out as one of the most successful and open examples of the transition from a partially state-capitalist market economy to a primarily privately owned market economy. The privatisation of small and medium state-owned companies and a liberal law on establishing new firms have allowed the development of an aggressive private sector, followed by a development of consumer rights organisations later on. Restructuring and privatisation of "sensitive sectors" (e.g., coal, steel, railways, and energy) has begun. The biggest privatisations so far were a sale of Telekomunikacja Polska, a national telecom to France Telecom (2000) and an issue of 30% shares of the biggest Polish bank, PKO BP, on the Polish stockmarket (2004). Poland has a large agricultural sector of private farms, that could be a leading producer of food in the European Union now that Poland is a member. Challenges remain, especially under-investment. Structural reforms in health care, education, the pension system, and state administration have resulted in larger-than-expected fiscal pressures. Warsaw leads Central Europe in foreign investment and needs a continued large inflow. GDP growth had been strong and steady from 1993 to 2000 with only a short slowdown from 2001 to 2002. The prospect of closer integration with the European Union has put the economy back on track, with growth of 3.7% annually in 2003, a rise from 1.4% annually in 2002. In 2004 GDP growth equalled 5.4%, and in 2005 3.3%. Forecasted GDP for 2006 is 5.5 - 6.0%. Although the Polish economy is currently undergoing economic progress, there are many challenges ahead. The most notable task on the horizon is the preparation of the economy (through continuing deep structural reforms) to allow Poland to meet the strict economic criteria for entry into the European Single Currency. There is much speculation as to just when Poland might be allowed to join the Eurozone, although the best guess estimates put the entry date somewhere between 2009 and 2013 . For now, Poland is preparing to make the Euro its official currency (though it has not joined the ERM yet), and the Złoty will eventually be abolished from the Polish economy. Since joining the European Union, many young Polish people have left their country to work in other EU countries because of high unemployment, which is the highest in the EU (14.1% in September 2006). Products Poland produces include clothes, electronics, cars (including luxury car Leopard), buses ( Autosan, Jelcz SA, Solaris, Solbus), helicopters ( PZL Świdnik), transport equipment, locomotives, planes ( PZL Mielec), ships, military engineering (including tanks, SPAAG systems), medicines ( Polpharma, Polfa, etc), food, chemical products etc. The education of Polish society was a goal of rulers as early as the 12th century. The library catalog of the Cathedral Chapter of Kraków dating back to 1110 shows that already in the early 12th century Polish intellectuals had access to the European literature. In 1364, in Kraków, the Jagiellonian University, founded by King Casimir III, became one of Europe's great early universities. In 1773 King Stanisław August Poniatowski established his Commission on National Education ( Komisja Edukacji Narodowej), the world's first state ministry of education. Today, Poland has more than a hundred tertiary education institutions; traditional universities to be found in its major cities of Gdańsk, Bydgoszcz, Katowice, Kraków, Lublin, Łódź, Olsztyn, Poznań, Rzeszów, Toruń, Warsaw, Wrocław and Zielona Góra as well as technical, medical, economic institutions elsewhere, employing around 61,000 workers. There are also around 300 research and development institutes, with about 10,000 more researchers. In total, there are around 91,000 scientists in Poland today. According to a recent report by the European Commission, Poland ranks 21st on the list of EU states in the area of innovation. Conditions for knowledge creation are worsening, particularly because of a decline in business Research and development, from 0.28% of GDP in 1998 to 0.16% in 2003. Public R&D expenditures were 0.43% of GDP in 2003. The share of university R&D funded by the business sector has also declined, indicating that firms have not turned to outsourcing research to make up for declining R&D expenditures. Because of the very low levels of R&D, the process of transition of Poland to a knowledge economy is slow. For more info, see Innovation performance factsheet. Rail: Poland's railways constitute one of the larger railway systems in the European Union, with 23,420 km of network (1998). Access to track has been opened up to competition as required by the EU. However, delays by successive Governments in reforming the state railway company, PKP , combined with the imposition of severe budgetary constraints, have caused a major cash crisis. Refurbishment of the network, bringing key routes into line with the standards on western European railway networks, is proceeding very slowly, and serious arrears of maintenance have resulted in the imposition of speed restrictions on many other lines. Line closures and the withdrawal of feeder services similar to those that took place in the UK under the 'Beeching Axe' have accelerated since 2000. Road: By Western European standards, Poland has a relatively poor infrastructure of expressways/highways. The Government has undertaken a programme to improve the standard of a number of significant national highways by 2013. The total length of expressways/highways is 364,657 km. There are a total of 9,283,000 registered passenger automobiles, as well as 1,762,000 registered trucks and buses (2000). Air: Poland has ten major airports (in decreasing order of traffic: Warsaw, Kraków, Katowice, Gdańsk, Wrocław, Poznań, Szczecin, Rzeszów, Bydgoszcz and Łódź), a total of 123 airports and airfields, as well as three heliports. The number of passengers at Polish airports has consistently increased since 1991. Marine: The total length of navigable rivers and canals is 3,812 km. The merchant marine consists of 114 ships, with an additional 100 ships registered outside the country. The principal ports and harbours are: Port of Gdańsk, Port of Gdynia, Port of Szczecin, Port of Świnoujście, Port of Ustka, Port of Kolobrzeg, Gliwice, Warsaw, Wrocław. Poland formerly played host to many languages, cultures, and religions. There was a particularly rich Jewish life in Poland prior to the Nazi Holocaust where Poland's Jewish population, estimated at 3 million was mass murdered, with an estimated 300,000 survivors. The outcomes of World War II and the following shift westwards to the area between the Curzon line and the Oder-Neisse line gave Poland an appearance of homogeneity. Today 36,983,700 people, or 96.74% of the population considers itself Polish (Census 2002), 471,500 (1.23%) declared another nationality. 774,900 people (2.03%) didn't declare any nationality. The officially recognized ethnic minorities include: Germans, Ukrainians, Lithuanians, Jews and Belarusians. The Polish language, a member of the West Slavic branch of the Slavic languages, functions as the official language of Poland. Most Poles adhere to the Roman Catholic faith, 89.8% are Catholic (according to church baptise statistics) with 75% counting as practicing Catholics. The rest of the population consists mainly of Eastern Orthodox (about 509 500), Jehovah's Witnesses (about 123 034) and various Protestant (about 86 880 in the largest Evangelical-Augsburg Church and about as many in smaller churches) religious minorities. In recent years Poland's population has stopped increasing because of an increase in emigration and a sharp drop in the birth rate. In 2005 the census office estimated the total population of Poland at 38,173,835, a slight fall on the 2002 figure of 38,230,080. Since Poland's accession to the European Union, a significant number of Polish people have moved to work in West European countries like the UK and Ireland.
" Stańczyk" painted by Jan Matejko. Polish culture has a rich thousand-year history influenced by both west and east. Today, we can see these influences in Polish architecture, folklore and art. Poland's culture has also been influenced by countries such as Italy, Ottoman Empire, France, the United Sates and many more. Poland is the birthplace of many world famous people, including Pope John Paul II ( Polish: Papież Jan Paweł II), Marie Skłodowska Curie ( Polish: Maria Skłodowska-Curie), Casimir Pulaski ( Polish: Kazimierz Pułaski), Frederic Chopin ( Polish: Fryderyk Chopin), Nicolaus Copernicus ( Polish: Mikołaj Kopernik), etc. Many other famous people, including Krzysztof Penderecki, Tadeusz Kościuszko, Henryk Sienkiewicz, Bolesław Prus, Adam Mickiewicz, Czesław Miłosz, Jan Matejko, Andrzej Wajda, Roman Polański, Krzysztof Kieślowski, Juliusz Słowacki, Witold Gombrowicz, Władysław Reymont, Wisława Szymborska came from Poland. Famous meals from Polish cuisine include bigos, kiełbasa, barszcz , czernina (duck blood soup), schabowy z kapustą, pierogi, gołąbki and various potato dishes. Reporters Without Borders world-wide press freedom index 2005: Rank 53rd out of 167 countries. Index of Economic Freedom 2005: Rank 41st out of 155 countries.